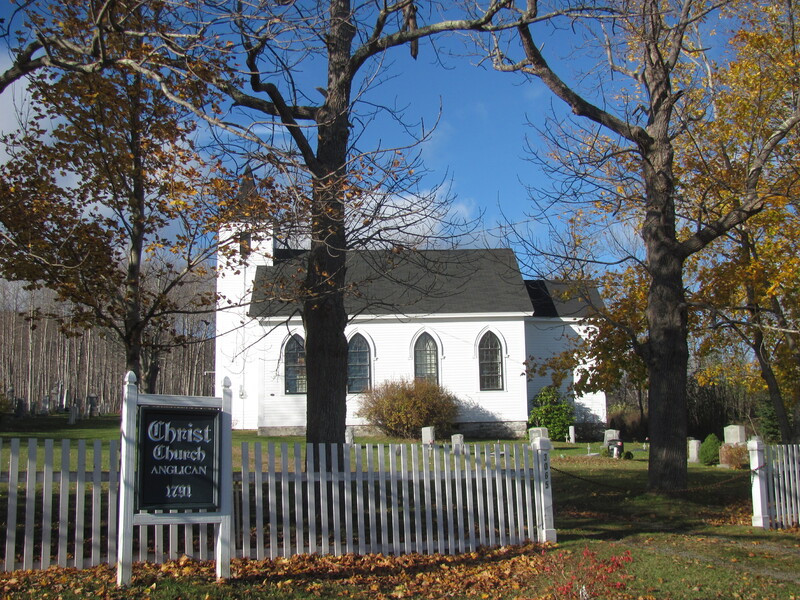 Old Anglican church in Karsdale. Victoria Beach where I live in Nova Scotia is 25 km. 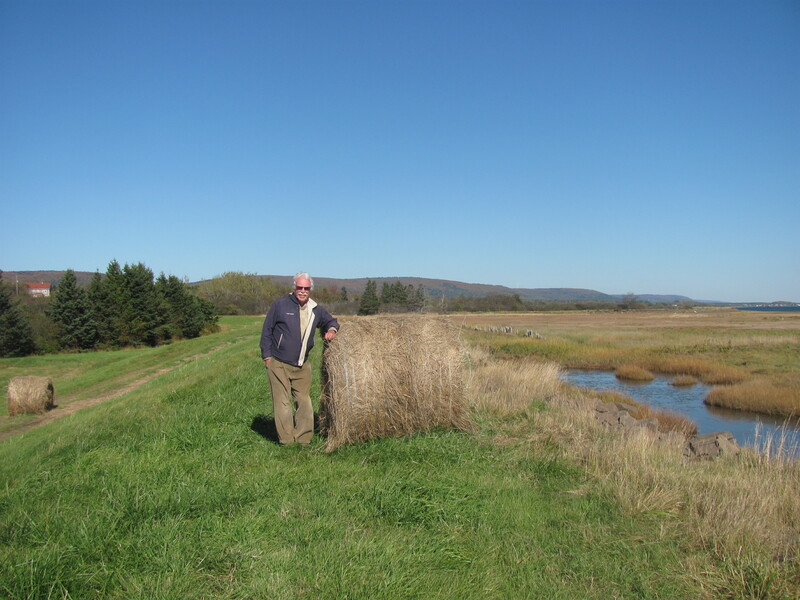 away from the nearest town of Annapolis Royal. Averaging three or four trips a week over the eight years I have lived here (not counting the months I am away travelling) translates into roughly 1,500 trips on the same road. 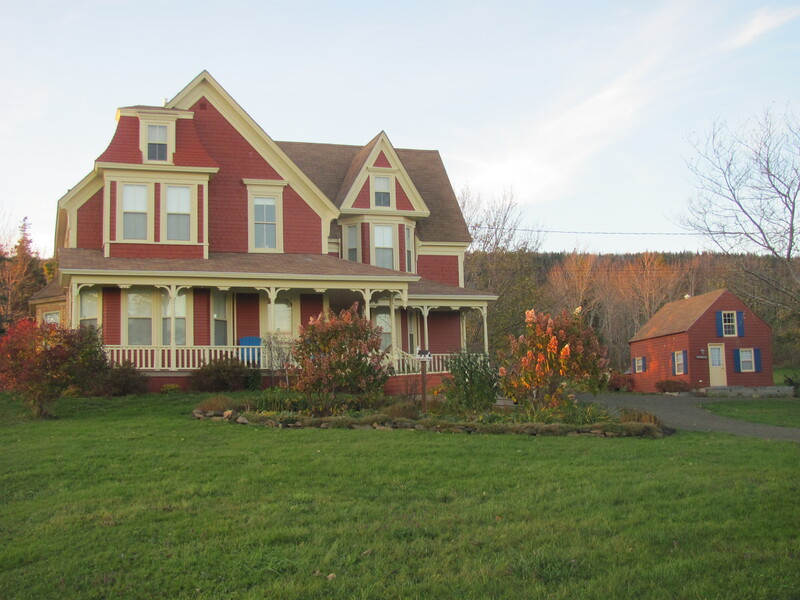 There is only one way those of us who live in Victoria Beach can get to Annapolis Royal and that is via Granville Road, the road which connects us. You might think that making this jaunt would be getting a bit boring by now, but strangely it hasn’t for the following reasons. 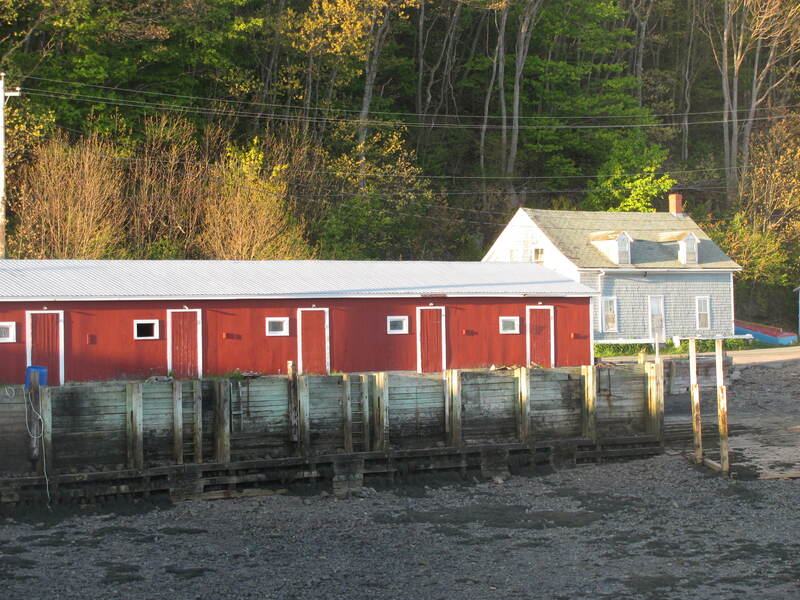 Fish sheds at the wharf in Victoria Beach. Since coming here, I have heard many people refer to my road as being “magical”. I have to agree that the scenery is ‘out of this world’ beautiful no matter the time of day, month, or year. My greatest thrill is driving my road just as the sun is rising to herald in a new day, something I get to do in the summer as I drive to the Saturday market. Fog and rain, of which we usually get plenty of, might spoil this trip, but as far as I am concerned there is always a silver lining to everything so even in bad weather there is a certain kind of beauty to how the fog seems to hover over the mountains or roll in lazily over the water. Unfortunately, I haven’t succeeded in finding anything positive about driving through a raging snow storm in winter which is one of the reasons I escape to Thailand. 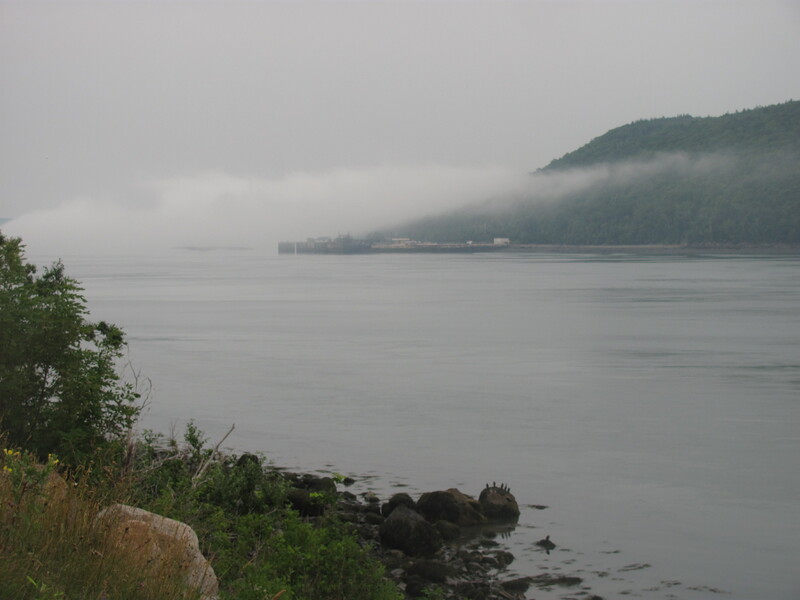 Fog creeping in over the water at Digby Gut in Victoria Beach. From the time I leave home until I reach my destination in Annapolis Royal, Granville Road will have taken me through six communities. Victoria Beach is the last village at the end of my road followed by Port Wade, then Karsdale, Port Royal, Granville Beach, and Granville Ferry. There is something unique about the history and environment of each one of them, but all share the water of the Annapolis Basin leading into the Bay of Fundy on the one side and the North mountain on the other. What makes this road so special is that it fulfills me on all levels – the physical, mental and the spiritual. On a physical level, I am conscious of the combination of mountain and water all around me as very seldom does my road take me away from either. If it does, I am still shrouded by the different hues of colour from the trees and other foilage along the road. Moreover, I adore the various types of architecture exhibited by many of the older homes. A few of them date back to the early 1730’s but most were built by fairly wealthy sea captains who resided here during Nova Scotia’s ‘Age of Sail’ in the mid 1800’s. The houses which were lucky enough to fall into caring hands have been tastefully renovated, but sadly others have been deserted and are now falling into disrepair. One of the road’s oldest houses is a Connecticut Salt Box, built circa 1730. It’s located in Granville Beach and was restored to its original state in the 1960’s by a Mr. Robert Patterson, an avid antique dealer from Toronto. It opens in the summer as a museum displaying his many Georgian treasures including a beautiful collection of Chippendale furniture. 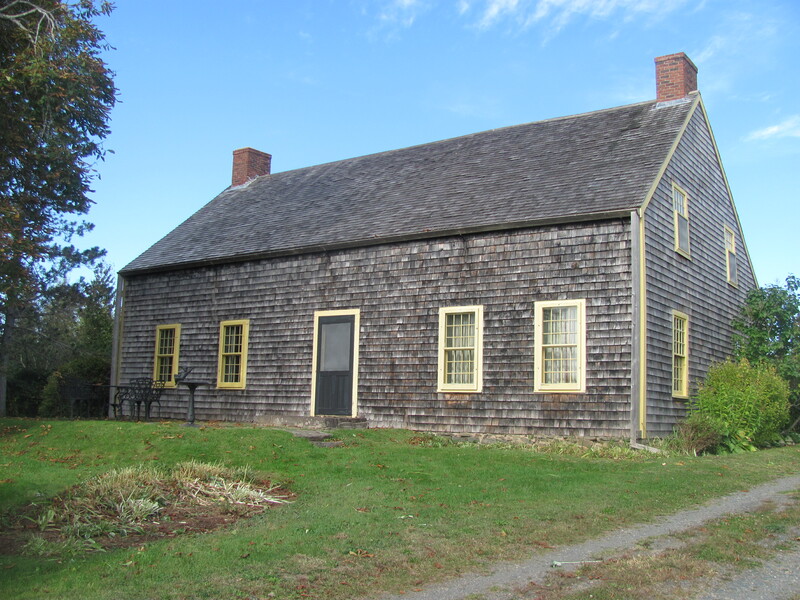 Nova Scotian saltbox home circa 1730, now the North Hills Museum in Granville Ferry. On a more intellectual level, this road offers me a past rich in history dating back to the very earliest settlers who came to this land in the early 1600’s. 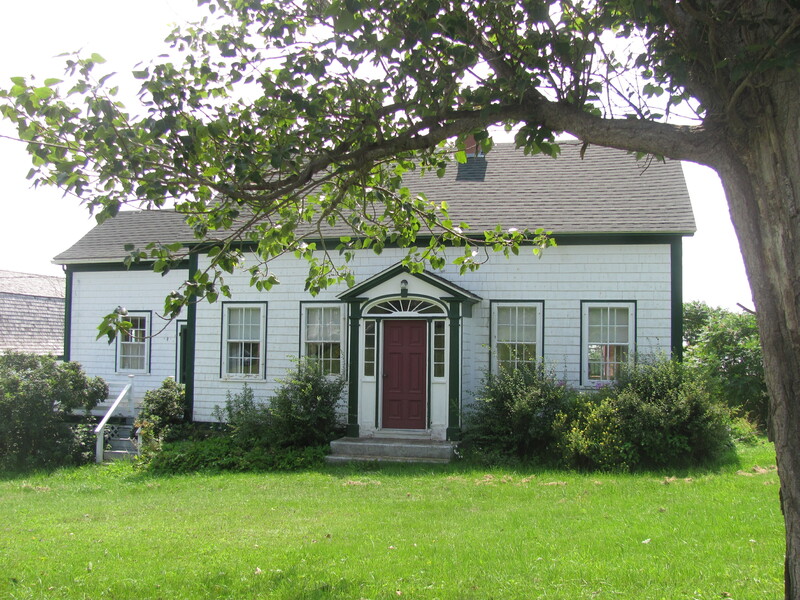 The area known as Port Royal, which extended from what is today the town of Annapolis Royal to the present day community of Port Royal just 10 km. away, was first sited by Samuel de Champlain in 1604. 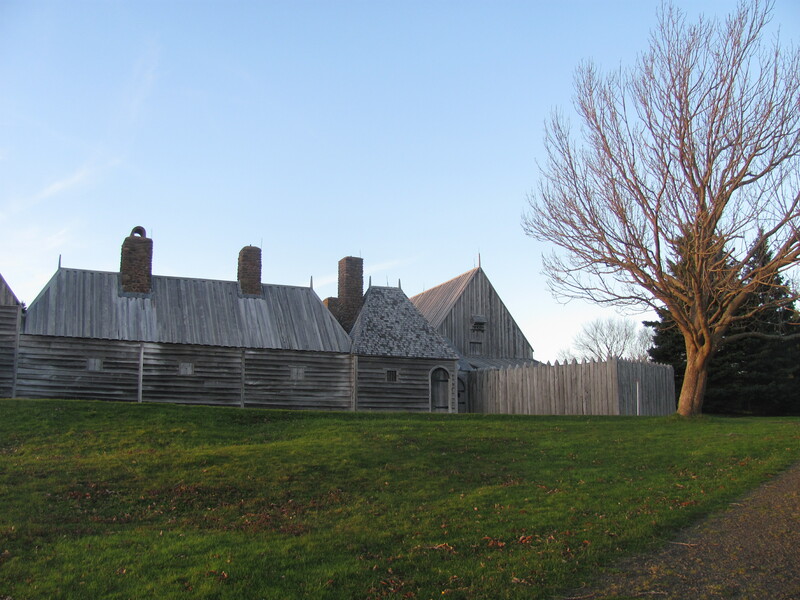 The following year he and Sieur de Mons built a settlement called the Habitation as a centre for the Acadians, making it the oldest settlement in North America beating out Jamestown, Virginia by two years and Quebec by three. These two French explorers along with the help of the gifted poet, Marc Lescarbot, who wrote and produced ” The Theatre of Neptune” the first drama ever written and produced in North America, were the reason for the settlement’s success. Thus, was born the Order of Good Cheer, a social club which not only kept the spirits of the men who accompanied them alive but still exists today. A nearly exact replica of the original is located here and is one of the road’s main tourist attractions. 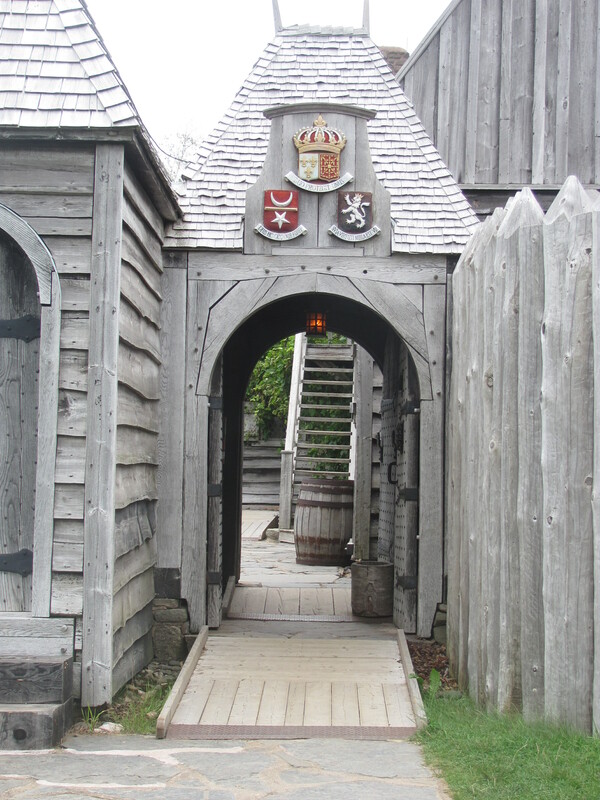 A replica of the Habitation in Port Royal. 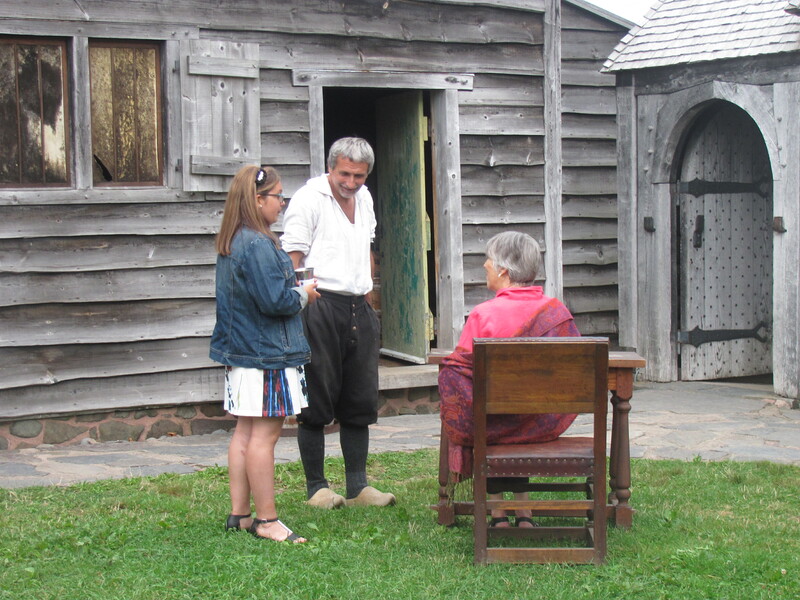 Inside the Habitation with Mr. Melanson, an Acadian guide, dressed in period costume. Second to Port Royal in historical significance would be Port Wade which was at one time a thriving port where some of the province’s most venerable sailing ships were built. For a short while it was noted for exporting iron ore to other parts of the world. Today it is home to one of the province’s many fish farms. Home built by Captain Snow, a well known ship builder, in Port Wade. The little community of Karsdale, next door to Port Wade, has its fair share of lovely old homes which have attracted many people from other parts of the country and continent who enjoy renovating as a retirement project. You can usually find a few of them up for sale or perhaps a few ‘fixer uppers’ if you are so inclined to try your hand at renovating. 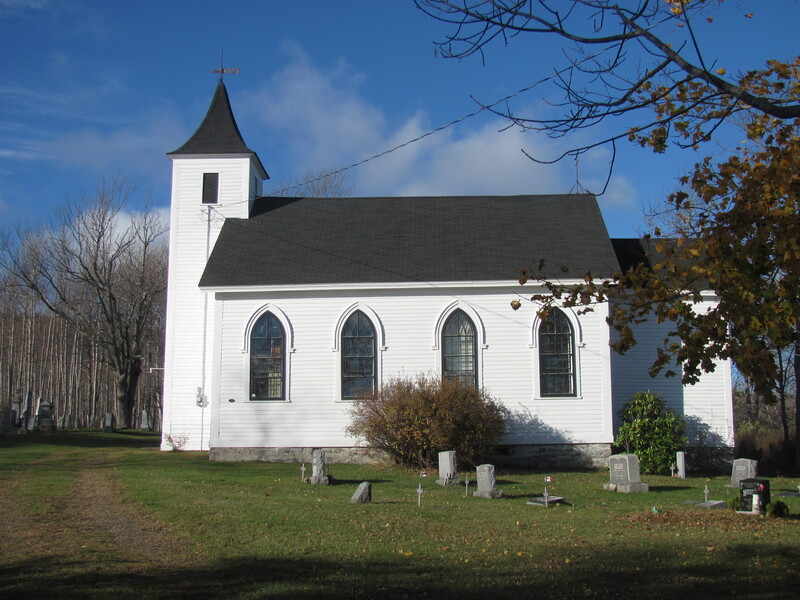 Karsdale can boast of a beautiful old Anglican church and graveyard going back to the mid 1800’s. 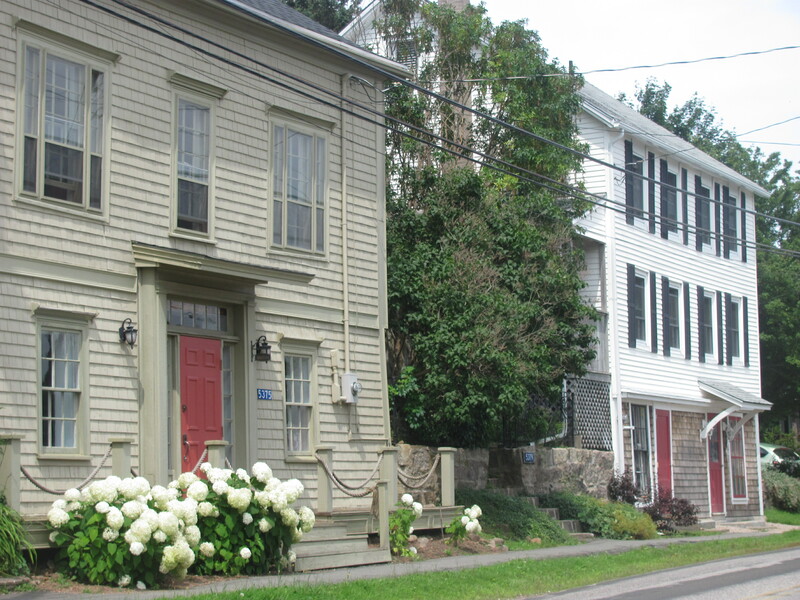 This community was named after William Kars, a war hero in the Crimean War, who made his home in Annapolis Royal. Another old house dating back to 1700’s. This one is for sale. As my road wends its way through Granville Beach, a dairy farm and a peach farm are in evidence. If I happen to be traveling my road around 5 p.m. a herd of cows just might bring me to a complete stop as their owner herds them back to their barn. Lovely baskets of peaches and nectarines are always available in the late summer at a nearby road stand. 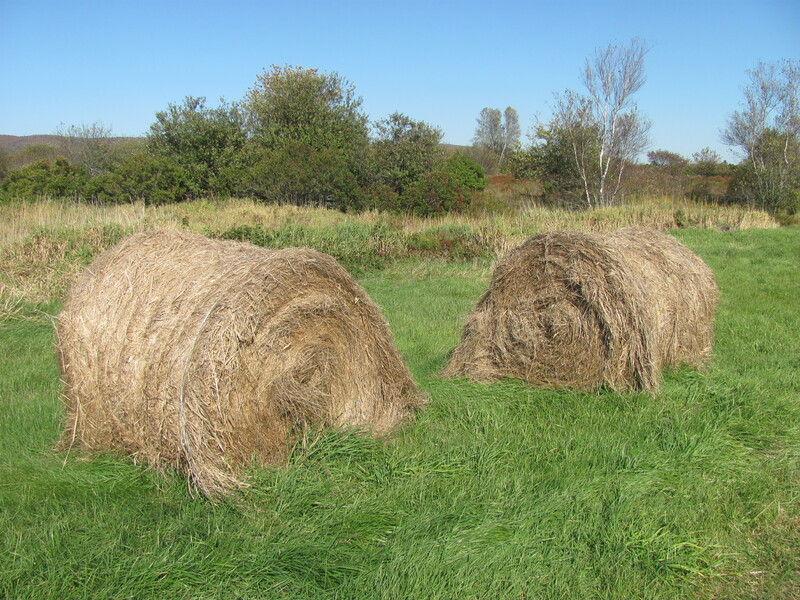 Those who are still farming here today have the early Acadians to thank for the fertility of the land. The dykes they built not only keep back the high tides but also the salt from the waters of the Annapolis Basin. These dykes are still in evidence today. Acadian dyke land on the Annapolis Basin – Granville Beach. Granville Ferry, the last port of call on my road and right at the causeway which leads into Annapolis Royal, is a fair sized village with a lovely mix of stately homes and old block houses built very close to the road. “The Ferry”, as it is commonly referred to by its residents, was the undisputed centre of the ship building trade that flourished during the great ‘Age of Sail’ in Nova Scotia. 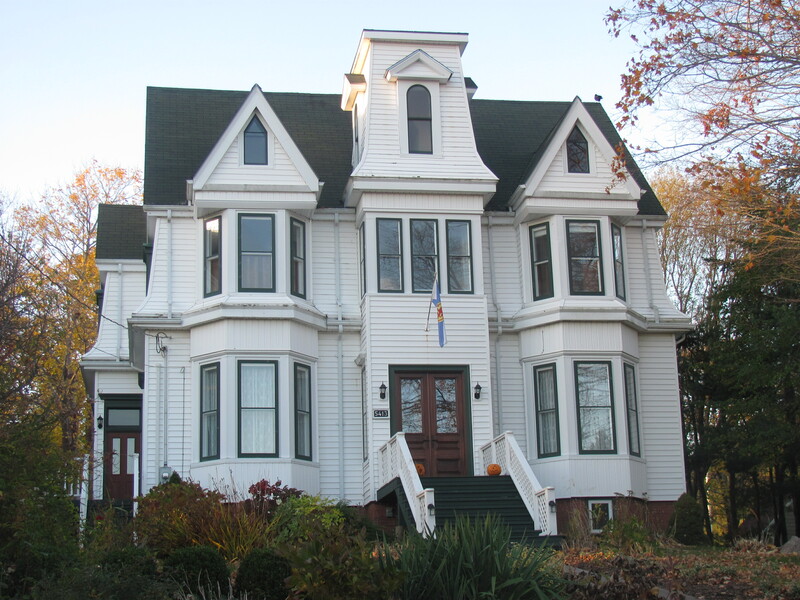 One of many stately homes in Granville Ferry. More Granville Ferry homes near the road. My road travels well beyond the physical and mental levels to that of the spiritual or more esoteric as some like to call it. Of course, there are churches (mostly Baptist) in all the communities which provided a form of spirituality for the majority of the people living here at one time. Today some of these churches are closed, and those that aren’t are facing a dwindling congregation and just barely hanging on. However, another kind of spiritual teaching reached the area in the 1970’s when a branch of Buddhism known as Shambala found a special energy radiating a feeling of peace all along the road which they claim aptly reflects the teachings of the Buddha. Perhaps this is why some refer to it as a “magical” road. Is it any wonder that my road has become a special friend who never fails to inspire me each time I drive on it? 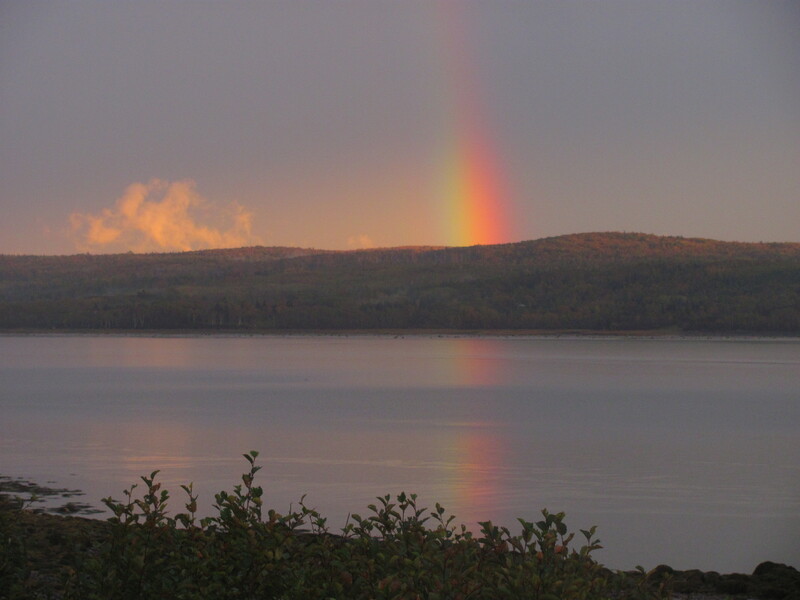 Taken from ‘my road’ one evening while traveling to Annapolis Royal. Thank you Betty for the beautiful description of our road. Hope you are having a wonderful winter so far. Thanks for reading my blog and for your comment, Sue. I am wondering where you live on Granville Road? I am also wondering if we have met since I don’t remember your name, something which I am terrible at doing. Remembering faces is easier. Thanks Jill. I will most definitely see you before I leave. By the way, when does Cheryl get back from her trip, do you know? I would like to see her, too, and I think she said she would try to get down to AR when she got back. I’ll keep you posted of when I might have some extra time when in town. Leo’s closes soon so there won’t be many places where we could meet. I guess there’s always the pub! Betty, I throughly enjoyed your drive down Granville Ferry Road. Thank you. Hi Valerie – Thanks for taking the time to read it. Perhaps you and Peter could actually drive down some time next year when we get back from our travels. Have a good winter. Hi Betty, I love hearing your perspective on the area and the way you accompany that with local pictures. Absolutely, a vortex of love! Thanks Shirley. I love your description ” A vortex of love”. Hi Bets – Lovely article! You really do live in a beautiful place and it’s nice to see you soaking it up! Thanks Sally. Can hardly wait to get back to Thailand and see you guys again! That was such a nice article it makes me want to take a road trip from Victoria Beach to Granville Ferry. Hope you keep writing over the winter and sharing more of your holiday adventures. Have fun, stay safe, and enjoy the sunshine. Thanks Sandra. I leave for Thailand on Dec.9 and will definitely continue blogging. Are you going south again to Texas? Thanks Helen. I would love for you to come down some time and enjoy it with me.